Ellery Schempp, one of the last living symbols of a series of Supreme Court cases that banned mandatory displays of faith in public schools, brought the contentious battle over religious expression to life for a Harvard Divinity School audience. For years, Diane Moore and her students have debated the implications of landmark Supreme Court decisions in her “Religion, Democracy, and Education” course at Harvard Divinity School (HDS). But they rarely get to dig past the scholarship to the actual names attached to those decisions — people like Ellery Schempp, a freethinking 16-year-old who, more than 50 years ago, decided to protest his suburban Pennsylvania high school’s mandatory daily Bible readings. As it turns out, Schempp, now 72, has been happily residing just a few miles away, in Medford, for the past 20 years. 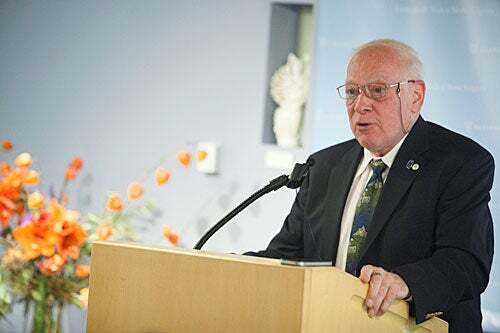 On Wednesday, he made the quick trip to the Center for the Study of World Religions to talk about his experiences as one of the last living symbols of a series of Supreme Court cases that banned state-sponsored displays of faith in public schools. “There are very few people who have won a Supreme Court case about First Amendment topics who come to Harvard Divinity School, and most of us are dead,” Schempp told his audience with characteristic bluntness. Schempp’s case, Abington School District v. Schempp (1963), effectively overturned laws in more than 30 states that endorsed or required Bible readings in public schools. Most of those laws were relics of late-19th-century anti-Catholic sentiment (Bible reading by lay people, such as teachers, was at the time a Protestant practice) and had gone largely unchallenged. But at the dawn of the 1960s, as the McCarthy era was ending and the Civil Rights Movement was beginning, cases like Schempp’s found their historical moment, said Moore, a senior lecturer in religious studies and education at HDS. One day in 1956, Schempp, who was raised a Unitarian Universalist, brought a Quran into the classroom and read it quietly during his class’s mandatory reading of 10 biblical verses. After being sent to the principal’s office and then to a guidance counselor (who wondered if he had problems with paternal authority), Schempp wrote a letter to the American Civil Liberties Union, which eventually took up his case. Driving him, he said, was a teenage sense of injustice: It didn’t seem fair that his Jewish and Catholic friends would be deemed problematic students or less patriotic citizens for failing to adhere to the Protestant faith that his school endorsed. “The court’s decisions reaffirmed that our founders were confident that you do not have to belong to a church or participate in public prayers in order to be a good citizen and a good person,” he said. For an outspoken skeptic of theistic beliefs, Schempp is surprisingly amenable to organized religion. A retired physicist, he is an active member in a Unitarian Universalist congregation in nearby Bedford. Other First Amendment advocates from Schempp’s era weren’t as lucky. He told the audience of Madalyn Murray O’Hair, an outspoken atheist and controversial public figure whose case, Murray v. Curtlett, was consolidated with Schempp’s when it went before the Supreme Court. In 1964, Time magazine dubbed Murray O’Hair “the most hated woman in America.” Her children were beaten up; her house was firebombed. In response, the fire department responders took a “particularly circuitous route” that took them 40 minutes to get to the scene, according to Schempp. For Moore’s class, the talk provided a lesson in the burden of public scrutiny that is sometimes borne by individuals who are swept up in high-profile cases. That is important to remember, because the “global trend to regulate belief” continues, said Nate Walker, a student in Moore’s class and a Unitarian minister, who had invited Schempp to speak. Earlier this year, the Kuwaiti parliament passed a law allowing the death penalty for the crime of insulting God, the prophet Muhammad, his wives, or the Quran. In Indonesia, a man faces 11 years in prison for posting “God doesn’t exist” on Facebook. “Throughout the world, governments are struggling to define when and where to grant religious freedom, to whom, and based on what rationale,” Walker said. Indeed, even in the United States, believers and nonbelievers continue to battle over where to draw the line between acceptable expressions of faith and unacceptable religious coercion in public schools, Schempp said. “We’re in a big economic hole, and we’re going to get out of it, but austerity can’t get you out of a recession. I don’t know why we have to learn this lesson over and over again. It just doesn’t work,” Michael Dukakis, a former three-term governor of Massachusetts, told his Harvard audience.